Having passed through many church-dotted, historic cities of Russia on my way from the country’s southernmost border, I would now head into the northern wilderness in search of more natural attractions, finding these in the great pristine forests of the North Urals, the rugged, tundra-fringed shore of the Barents Sea and the beautiful Tersky Coastline of the Kola Peninsula. Finally, on Russia’s western border, I would complete my 2015 trip across Russia’s European Heartland. It’s the afternoon of the 11th June 2015 and with the truck in a secure car park, I say goodbye to my host Isa and get on an overnight train which takes me to Sosnogorsk, a small railway town next to the larger oil-city of Uktha, once the centre of one arm of Stalin’s GULag network. 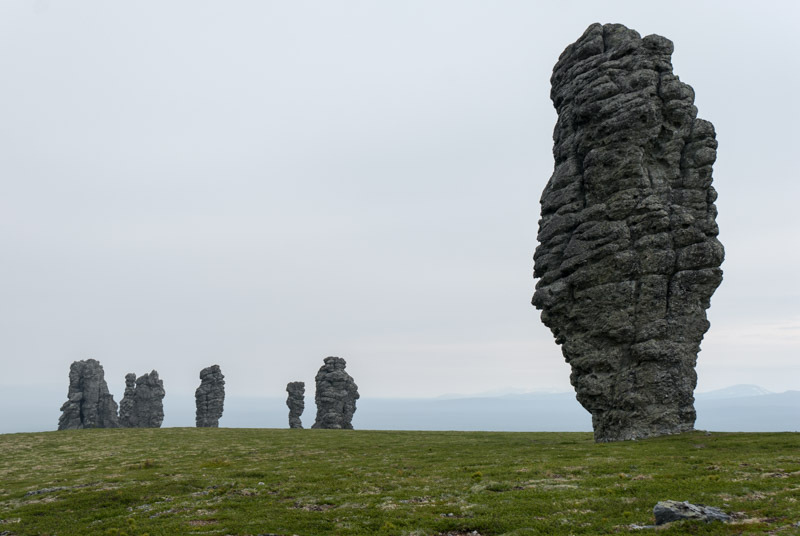 I am on my way to the far-flung town of Troitsko-Pechorsk on the Pechora River, where I will join a group of Russian tourists to visit the remote rock formations of Manpupuner, located in the wilderness of the North Urals, far beyond any road. In the waiting room of Sosnogorsk’s small railway station I meet Alexander, a corporate lawyer from Moscow, who is on the same tour and informs me that due to a last minute cancellation, it will be just the two of us (and guides) making the journey. We take the daily train south-eastwards, which crawls along the lumpy, single railway line reaching its terminus at Troitsko-Pechorsk just after midday. Here we are met by a driver in a minibus loaded with boxes of supplies and large plastic petrol cans, who takes us to a billiard-hall come restaurant where the local police immediately arrive to drag out an aggressive drunk. After lunch, we are driven fifty kilometres to a small clearing on the bank of the Pechora just opposite the village of Ust-Ilych, which marks the junction of the Ilych and Pechora Rivers. We are met by a man in a long wooden boat and after loading the fuel and supplies, we quickly get moving on the cold, calm waters of the Ilych, heading into the unspoiled wilderness of Europe’s eastern frontier. Alexander and I hunker down under tarpaulins to keep out the freezing cold air and admire the scenery. The river’s broad meanders are lined with a wall of pine trees broken only very occasionally by villages perched on the grassy riverbanks. It is in the third of these, Yeremeyevo, that we stop after eighty kilometres to sleep for the night in the house of our guide Zhenya. 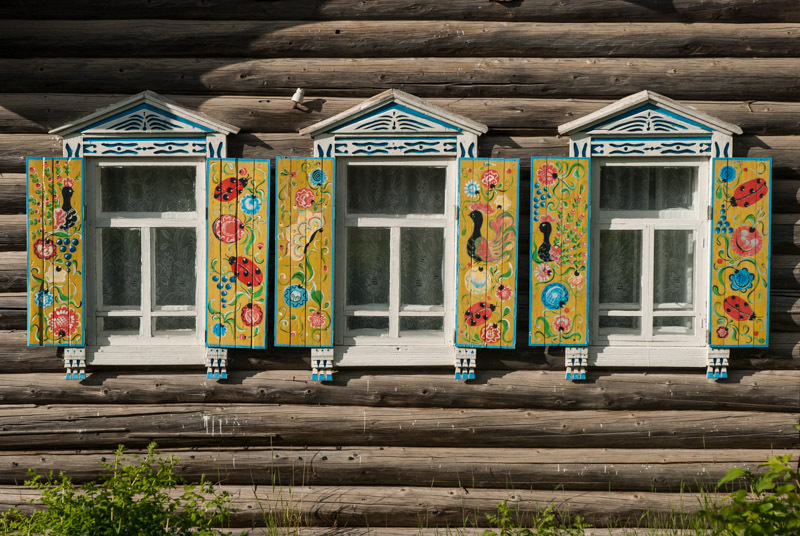 Yeremeyevo is a somewhat idyllic settlement consisting of neatly attractive wooden houses overlooking the wide, beautiful Ilych. 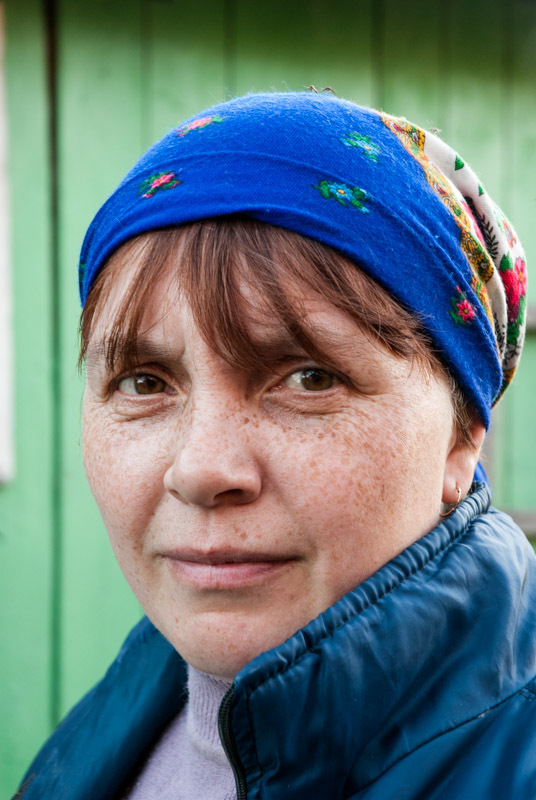 Unlike most settlements of the Komi Republic the population here is entirely Komi, an indigenous Finno-Ugric nation of whom many, including our hosts, retain their indigenous Komi-Zyrian language; highly unusual in Russia where many Finno-Ugric nations are highly assimilated into Russian culture. Zhenya’s wife cooks an excellent dinner of grayling (which our hosts prefer to eat salted and raw, though I ask to be cooked) alongside excellent home-grown potatoes; perhaps the best-tasting freshwater fish I have ever eaten. Yeremeyevo is the furthermost settlement on the Ilych and as we continue our journey up-river the following day, it narrows and enters denser forests, occasionally passing craggy cliffs of heavily uplifted rock strata as we enter the low, undulating, forested ridges of the Urals. We stop at three kordons; firstly at Izpryed where the two friendly rangers check our permits and allow us to continue into the Pechoro-Ilych Reserve, then at Shezhymdikost for lunch, and finally at the ranger station of Ust-Lyaga, 120 kilometres up-river from Yeremeyevo, where we will spend the night before continuing on foot tomorrow. In Ust-Lyaga we meet our second guide Sasha, who along with Zhenya prepares us another excellent dinner of freshly caught fish, whilst preferring to eat cheap kolbasa (luncheon sausage) themselves. Alexander and I make use of the camp’s banya and wrap up the evening alternating between sweating in the scalding steam room and plunging naked into the near-freezing water of the Ilych. 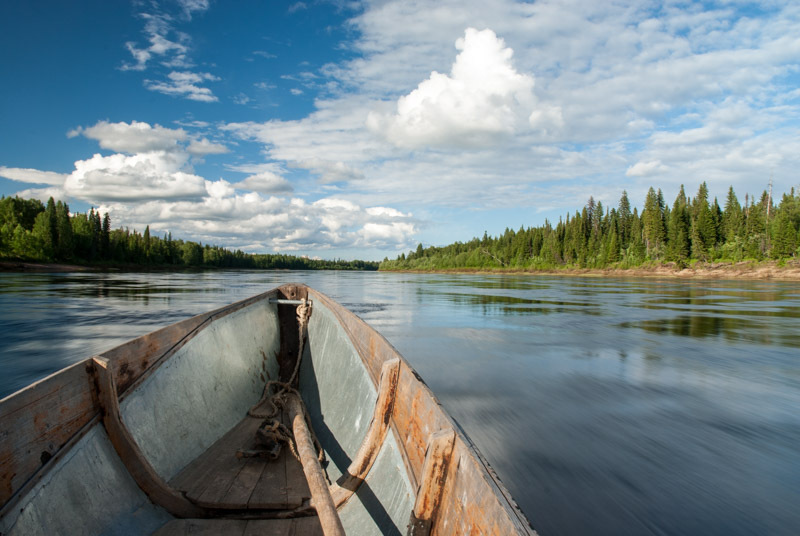 Out of the noisy boat, I notice the great beauty of the river, which passes slowly in majestic silence, its surface disturbed only by the tiniest of eddies as it makes its way towards the Arctic under a sky of subtle blues, yellows and pinks which mark an extended twilight above the soft curves of low, pine-clad hills. The following morning, after a very short boat journey to the mouth of the Ydzhydlyaga River we begin a twenty-kilometre walk through thick, dark, boggy, forest of lichen-covered birches and pines. I soon realise that I am rather under-equipped, having previously imagined a pleasant walk through dry pine forest. After a few kilometres the joy of being in untouched nature has long-since worn off and the boggy path, constantly made worse by tree roots, infinite hordes of biting mosquitoes, constant diversions around swampy sections and the pain in my left ankle which I twisted in the banya yesterday, has become a masochistic ordeal. At the very end of the day however, as I abruptly emerge from the dense forest onto a high bank of the Ydzhydlyaga, I have my first view of a treeless ridge of the Urals, on top of which are the seven natural stone towers known in the native Mansi language as Manpupuner (‘Mountain of Idols’). The view of the towers is utterly enthralling and enchanting, almost menacing in their verticality compared with the low, ancient ridge; the seven giants standing silently, eternally, far in the distance beyond yet more of this terrible forest. Somehow this glimpsed vision of the giants expresses to my mind perfectly the mystery of these dark, endless expanses of northern Russia where they lurk, magnificent and unseen. I can well appreciate how in the past the native Mansi tribes revered the idols fearfully and forbade themselves from climbing their ridge. The fourth day starts calmly beside the Ydzhydlyaga, before we re-enter the wearying forest; though after some hours the very faint path starts to climb, finally leaving the swamps. Here I get a surge of motivation and pass Alexander and our guides, keen to reach the ridgeline before it clouds over. I climb briskly beyond the treeline at about 600 metres elevation, topping the ridge at around 750 metres, a few hundred metres distant from the giants. The view is simply astounding and all the miserable slogging through the forest is quite forgotten. Here is one of the most singularly striking natural wonders I have ever seen, with the seven stone towers of Manpupuner perched on the treeless alpine tundra of the ridge, overlooking a veritable ocean of forest stretching to the northern and western horizons, punctuated only very distantly by the bare ridges of the Urals and absolutely devoid of any trace of human presence. This thankfully protected forest is part of the largest swath of primeval forest remaining in Europe today. To the south and east are more bare ridges, demarcating the notional border between Europe and Asia. The rock formations themselves appear a dark, igneous grey but this is merely a thick covering of lichen covering the white, resistant schists from which they are made and which have weathered more slowly than the surrounding rock, leaving the seven towers between thirty and forty-two metres in height. I spend several hours around the rocks, enjoying them from all angles and looking out over the sea of forest. We rest at night in a recently constructed wooden hut (with the timber having been brought in by helicopter) and awake in the morning to low cloud and light rain, giving the giants a different, more brooding atmosphere without the expansive backdrop. Then begins the long return journey, retracing our route back for two days through the forest to the Ilych. Alexander and I often walk together and I feel that I get to know him quite deeply; a childhood marked by the relationship issues of his parents, an adolescent dream of visiting the US shattered upon finally visiting the country and finding a flimsy, commercialised reality. He also admits to being a womaniser, a pick-up artist and an assassin of aggressive feral dog packs in suburban Moscow. 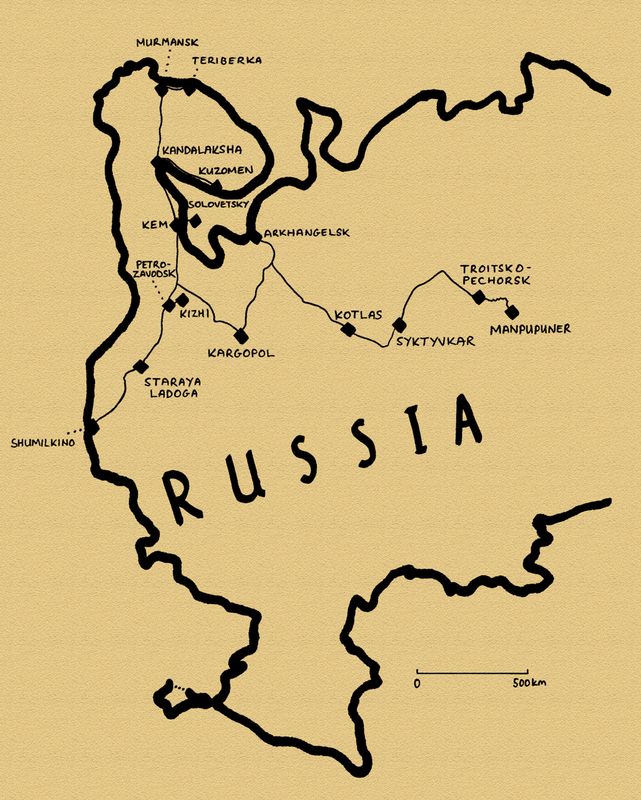 We return down-river, finally reaching Troitsko-Pechorsk and checking into a hotel, though I split with Alexander and take an overnight minibus back to Syktyvkar, saving more than a day compared to the sedate trundling of Russian Railways. I reach Syktyvkar at around 04:30, though the sun is already up, giving an odd feeling of walking in daylight through a dormant city. After having breakfast with Isa and thanking her profusely for her early-morning hospitality, I collect the truck and begin the road journey broadly north-westwards towards the Arctic. After the exertions of the last few days it’s a great pleasure to be driving the truck again and comfortably watching the world go past my window. After back-tracking on the main road towards Kirov for just over a hundred kilometres, I turn westwards and soon enter Arkhangelsk Region, where the scenery starts to change subtly from the dense, flat taiga (boreal forest) of Komi to a slightly more settled landscape of gently rolling hills. In the sprawling and rather ugly logging town of Kotlas, once also a major locus of Stalin’s GULag network, I join the Northern Dvina River whose wide, coffee-coloured waters I cross on a bridge just west of town. I follow the Northern Dvina downstream on a road which is partly paved and partly well-graded gravel, passing villages of traditional wooden houses; some extremely pretty and well kept and others derelict and collapsing. I camp for the night near a junction with the busy M8 Highway, which I drive the following morning to the delta of the Northern Dvina, which I cross once more on a long, pot-holed Soviet bridge to enter the city of Arkhangelsk, the chief port of medieval Russia. I’m hosted in Arkhangelsk by Vladimir, who I join for a late breakfast. I immediately find Vladimir a very likeable, laid-back character and he soon calls his friend Alexander who drives us forty-five kilometres to the formerly closed city of Severodvinsk. Parking at a small patch of coastal forest, we walk onto a wide, sandy beach with picnicking families and a groups of youths drinking beer around a parked car blaring out tawdry music. The view is surprisingly beautiful; of a wide, clean beach shelving very gently out into the calm waters of the White Sea in which people are swimming and paddling dinghies. 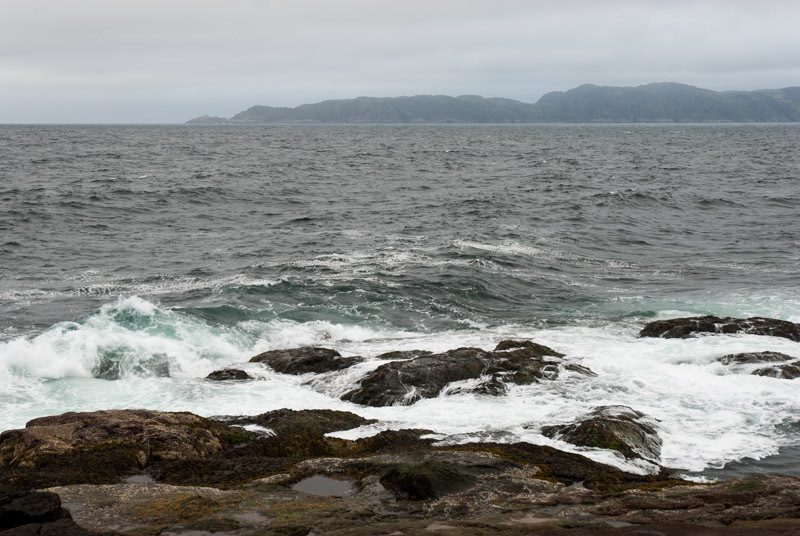 It’s hard to believe we’re little more than two hundred kilometres south of the Arctic Circle. Alexander takes us around Severodvinsk, stopping to peek across a small inlet to the nuclear submarine yard whose presence made the city firmly closed to all outsiders during the Soviet period, then into a pleasingly harmonious and uncrowded city centre of preserved Soviet architecture. I immediately warm to the atmosphere of Severodvinsk and we stay for dinner and beer, only returning to Arkhangelsk in the evening. Vladimir and I walk into the centre later in the evening, watching a beautiful pink sunset over the Northern Dvina at around 23:30, then heading into a bar for a few drinks and emerging at around 02:00 to a somewhat disorientating pinkish dawn light, with the sun rising just as we return to the apartment to sleep. Whilst this region has been settled since the earliest times of Russian history it was not until the mid-sixteenth century that the British, unsuccessfully searching for the North-east Passage to China, inadvertently opened a trade route to Russia via the Northern Dvina. In 1584 Ivan IV (Ivan the Terrible) founded New Kholmogory, which would later become Arkhangelsk, Russia’s principal sea port, though one that was made inaccessible by ice for several months of each year. When Peter the Great defeated the Swedes in the Baltic and established Saint Petersburg in 1703, he realised his dream of giving Russia a year-round, ice-free port and Arkhangelsk rapidly declined in importance. Today, Arkhangelsk is directly connected by rail and highway to Moscow and is no backwater, but my overwhelming impression after a day touring the city with Vladimir is of neglect and lassitude. There are numerous damp, warped and subsiding pastel coloured wooden apartment buildings, some in a shockingly advanced state of decay and creaking Soviet infrastructure of potholed roads and bowed tram tracks. It is nevertheless a very likeable place, and I’m slightly sad when my time with Vladimir in this shabby old port draws to an close. I leave Arkhangelsk and initially double back on the main highway towards Moscow, then join smaller, mostly unpaved roads which lead towards the Onega River. After several hours driving through the endless taiga, I reach the town of Plesetsk, connected to Russia’s Plesetsk Cosmodrome. Once an ICBM launch site, today Plesetsk is used for occasional high-latitude satellite launches and I know that a launch is imminent, but no firm date has been published. I later find a Soyuz launch took place the following day. 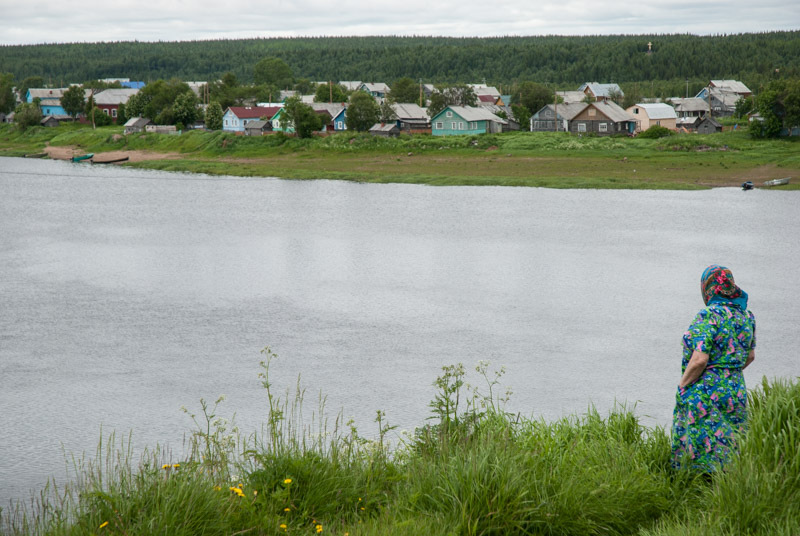 The road eventually crosses the Onega near the village of Sholokhovskaya. It’s late in the evening, twilight is slowly descending and I stop at what is a blissfully tranquil spot; on the one side is the pretty village perched on the riverbank, with a skyline dotted by ancient, slightly dilapidated wooden steeples and domes, whilst on the other, a fisherman silently punts a canoe across the wide, millpond water of the Onega, whose surface is only very faintly disturbed by the very light drizzle. I find myself in the town of Kargopol the following morning which surprises me with its abundance of ancient churches; rather like a northern Suzdal, though totally devoid of tourists. Today a charming backwater, Kargopol is an ancient place and must once have been one of the northernmost settlements of the Slavs. With the opening of Arkhangelsk’s maritime trade route in the sixteenth century, Kargopol prospered as a staging post on the road from Moscow. The city’s fortunes also waned in parallel with Arkhangelsk’s, though like many of Russia’s most faded cities, it was also bypassed by the railway. 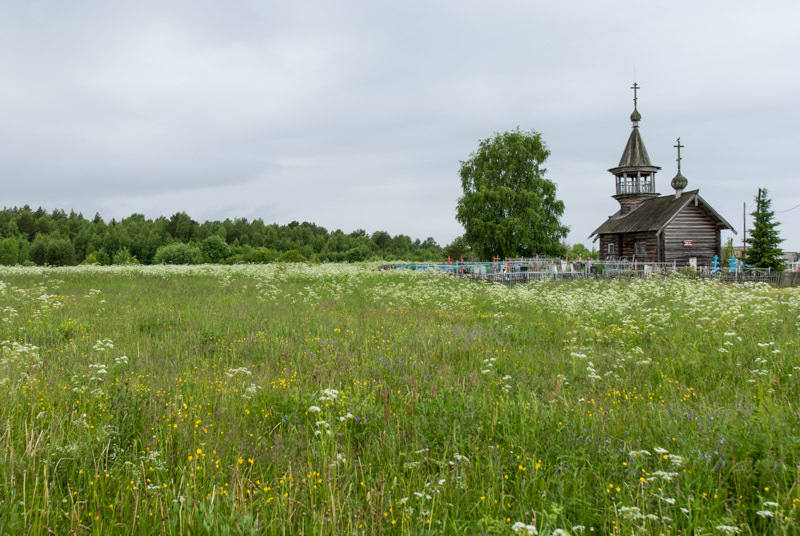 All this makes me fall for Kargopol; a quiet, untouched slice of ancient Russia, and I spend several hours strolling and admiring numerous fine sixteenth to eighteenth century churches which spread along quiet streets roughly alongside the overgrown, grassy bank of the Onega. At midday I begin a long drive, leaving Kargopol on an unsurfaced road heading westwards and entering the Republic of Karelia, the homeland of the Karelians who live on both sides of the Russia – Finland border. 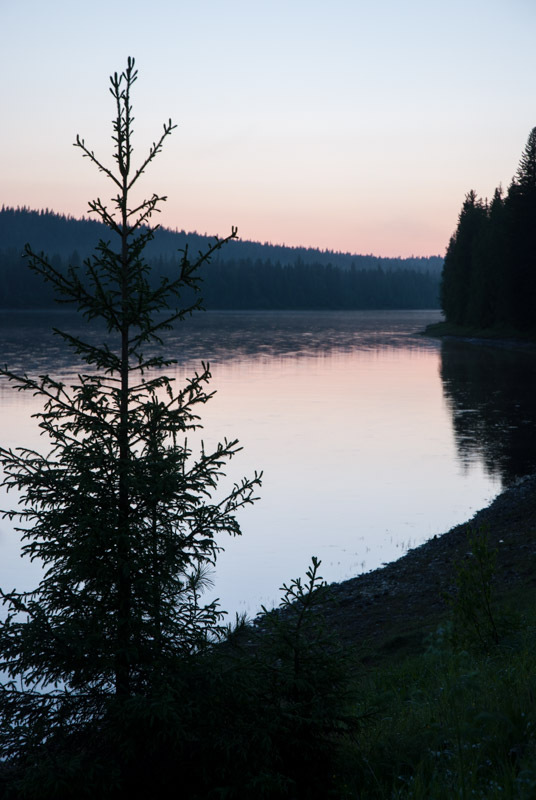 Karelia is subtly beautiful; a land of ancient forests and meadows dotted with small, wild lakes and neat villages. There is somehow something softer, more European about it than other parts of the north and I immediately warm to it. Like Arkhangelsk Region it is home to some fine pieces of wooden architecture and so despite the persistent rain, I stop in the village of Pyalma which sits almost on the shore of Lake Onega and has a quaintly miniature wooden chapel in a small graveyard. Late in the afternoon I join the main M10 Highway connecting Saint Petersburg with Murmansk on the Arctic Coast and drive steadily north as far as the Kem River, where I camp on the shores of a reservoir, watching an otter swimming on its back and later hearing an owl hoot in the trees directly above me. I start early the next morning, driving the short distance through the town of Kem to the small port of Rabocheostrovsk where I park the truck and board a ferry out into the White Sea to the infamous Solovetsky Islands. It’s a perfectly clear, cloudless morning and the White Sea is an endless shimmering plain of liquid light. The ferry heads out into a seascape where deep blue sky meets deep blue sea and soon the low, sculpted form of the Solovetsky Archipelago appear in the distance. 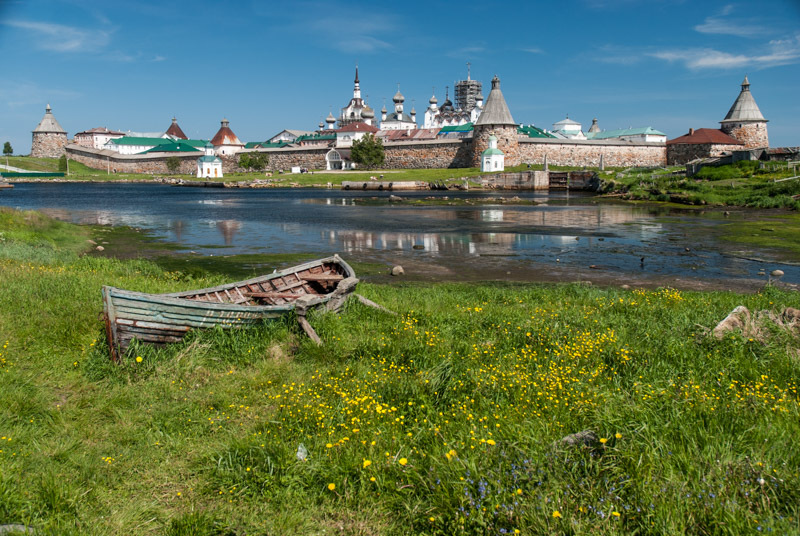 The Solovetsky Islands have been centre of monasticism since the fifteenth century and the main island, where the ferry docks, is dominated by the massive, almost Cyclopean walls of Solovetsky Monastery. Now both an active monastery and a tourist attraction, this fortress on the White Sea has withstood the sieges, uprisings and invasions of the last few centuries of Russian history, but it is also an important landmark in perhaps the darkest period of Russian history. Under the Soviets, Solovetsky Monastery was liquidated in 1920 and the islands became a prison camp; the archetype of Stalin’s GULag which would enslave and murder many millions of Soviet citizens. After exploring the monastery and its surroundings, I walk along the beach and find a quiet spot, looking out to a greying sea. I’m no fan of the crowds of tourists and with only a day on the island and no means of transport other than walking, I lack the time required to fully explore the islands and once more feel slightly frustrated at the pace of the trip. 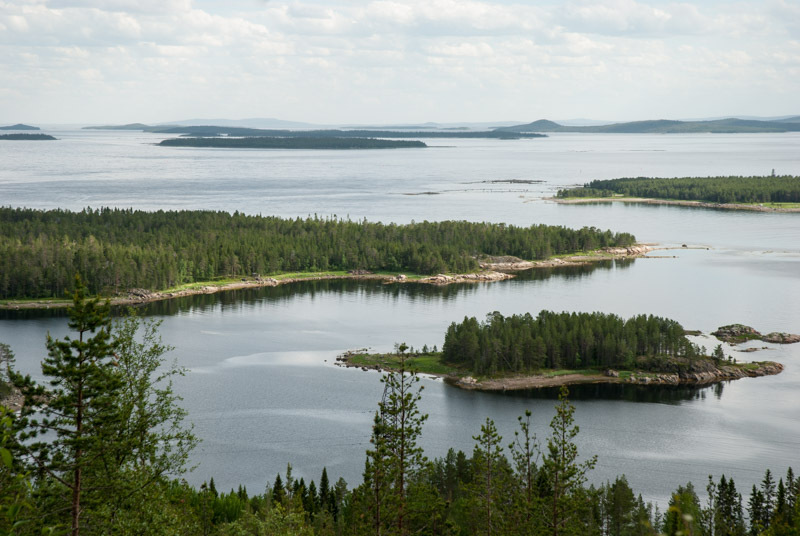 Back on the mainland, I spend the evening and much of the next day driving steadily north, first through Karelia, through a largely unpopulated wilderness of forests and small lakes. I stop at a roadside monument which marks the Arctic Circle at 65.56º North before driving on into Arctic territory for the first time in my life. Soon after, I enter Murmansk Region and cross a final inlet of the White Sea, pushing ever further north onto the root of the vast Kola Peninsula. Around the copper and mining city of Monchegorsk the Arctic wilderness is rudely interrupted by a localised ecological disaster zone of dead forest, but soon after the scars of the landscape heal and I’m back driving around pristine-looking lakes backed by low mountains still lightly flecked with last winter’s snow. By mid afternoon I reach the regional capital, Murmansk, which with a population of around 300,000 is by far the largest city in the world above the Arctic Circle. Murmansk was also the last city founded in the Russia Empire, just two years before the October Revolution and was an important port during twentieth century conflicts, despite being set on an inlet relatively far from the ocean. I walk across the city and climb a small hill where the thirty-six metre high Alyosha Monument, a Soviet solider in a greatcoat with a rifle slung over his soldier overlooks Kola Bay; a piece of 1970s Soviet monumental concrete outdone in size only by ‘The Motherland Calls’ in Volgograd. I’m hosted in Murmansk for one sunlit night by Igor and Marina, a middle-aged couple who live in an apartment with their very excitable Dalmatian Bert. Above their kind hospitality I’m inspired by the couple who, despite being in their fifties, make road trips into neighbouring Finland (where they claim mosquito numbers are far more manageable) on a tandem bicycle, towing Bert along in a trailer. I make another walking trip into Murmansk the following morning, this time to the city’s elegant twentieth century centre which I immediately like. Murmansk is a city which seems to me remarkable only for how ordinary it looks, with little to distinguish it from other Russia cities. Murmansk was the type of far-flung outpost which the USSR could support, but in today’s post Cold-War, market-driven economy, despite remaining an important centre for the Russian Navy and Air Force, it is a city in decline. Thankfully, this does not translate to obvious decay and dereliction, but instead means that Murmansk’s centre is unspoiled by ugly modern development, retaining a harmonious centre of grandiose civic architecture from the heyday of the Soviet Union. 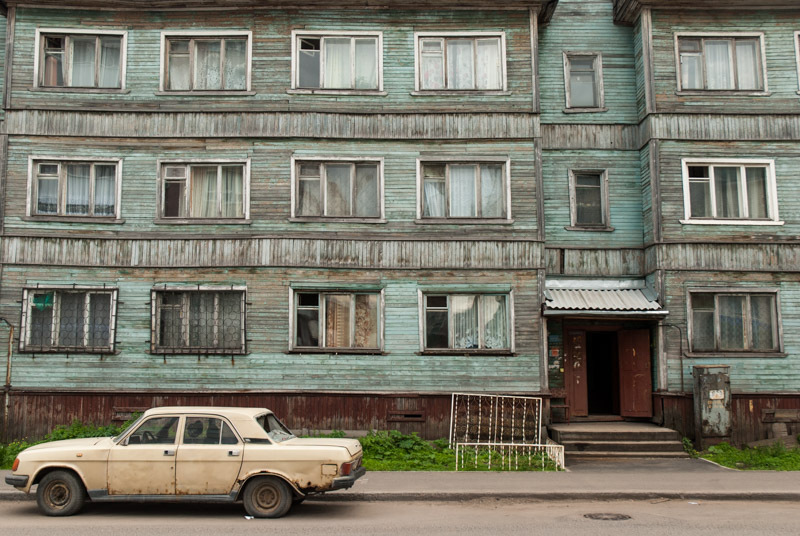 In fact, the damp, patinaed pastels of Murmansk are perhaps the best-preserved example of a Soviet city I can remember seeing since Minsk. Wanting to see the Arctic coastline, I set off eastwards onto the Kola Peninsula in the afternoon, finally leaving the forests and entering the tundra; an undulating landscape of thick, spongy herbs which smell almost like the wormwood-steppes of Central Asia but which are full of bloodthirsty mosquitoes that emerge in clouds with each step I make onto the spongy flora underfoot. Turning north, I reach the coastline in the half-abandoned looking fishing town of Teriberka, beyond which I find a rough track down to the coast where I camp for another ‘night’. This is far from being the northernmost point of mainland Europe, but unlike Norway’s Nordkapp, the coast here is truly the edge of the Eurasian landmass, for there is nothing north of here but unbroken sea for 2,320 kilometres to the North Pole. In fact, walking down to the coast of the thrashing, steely-blue waters of the Barents Sea and looking out beyond the rose-pink headlands which bound Teriberka Bay, I can’t help but think of the Ancients whose world was flat and bounded by the huge, mythical River Ocean. Teriberka marks the northernmost extent of the trip, and from here I will do some lengthy backtracking, starting with the road to Murmansk and then the highway back towards Karelia. I make a side trip through Apatity to Kirovsk on the edge of the Khibiny Mountains, but they are obscured with low cloud, making me return to the highway and turn east in Kandalaksha on the southern edge of the peninsula, which is known as the Tersky Coast. This coastline remains home to descendants of early Russian settlers known as Pomors who moved from The Novgorod Republic to the shores of the White Sea as early as the twelfth century, long before the rise of Moscow, and were generally engaged in fishing and other local enterprises rather than falling under the ownership of feudal landlords. 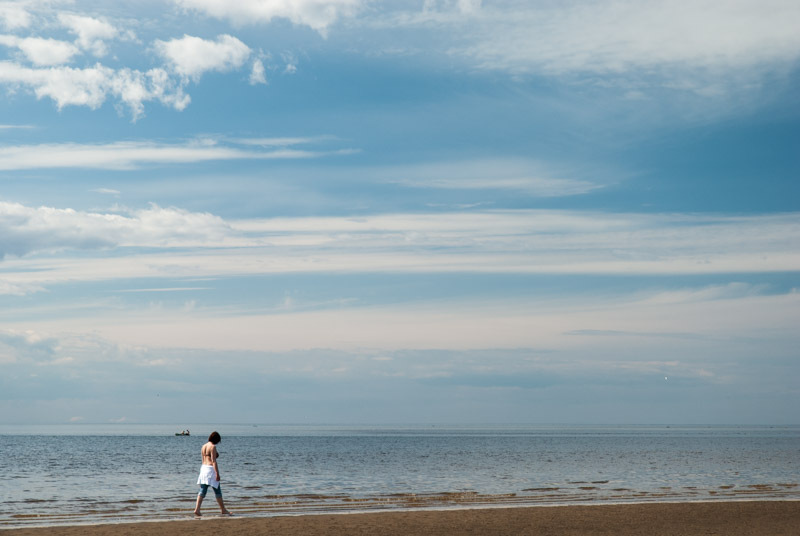 I spend a whole day driving slowly along the Tersky Coast starting in thick forests around Umba, then descending to the beautiful shoreline and stopping in the village of Varzuga, located around twenty kilometres inland. Famed for its salmon-rich river, Varzuga dates from the late fifteenth century, making it perhaps the oldest settlement on the peninsula. 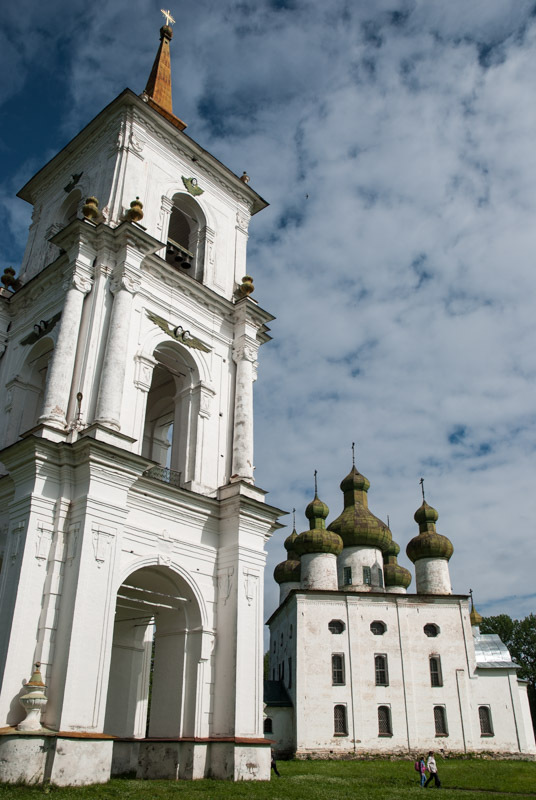 It also feels wonderfully isolated, with just a few hundred inhabitants living in attractive wooden houses surrounding the fine, all-wooden Church of St Afanasy, which dates from the nineteenth century but was originally constructed by monks from the Solovetsky Islands in the fifteenth century. Near Varzuga a four-wheel-drive track leads into the forest, becoming deep sand and emerging at the even smaller village of Kuzomen. Despite being located very nearly on the Arctic Circle, Kuzomen has the feel of a remote desert settlement with a main street of soft sand and wooden walkways for pedestrians. Neat wooden houses sit behind picket fences and horses roam the streets; perhaps more practical than wheeled vehicles for getting around. 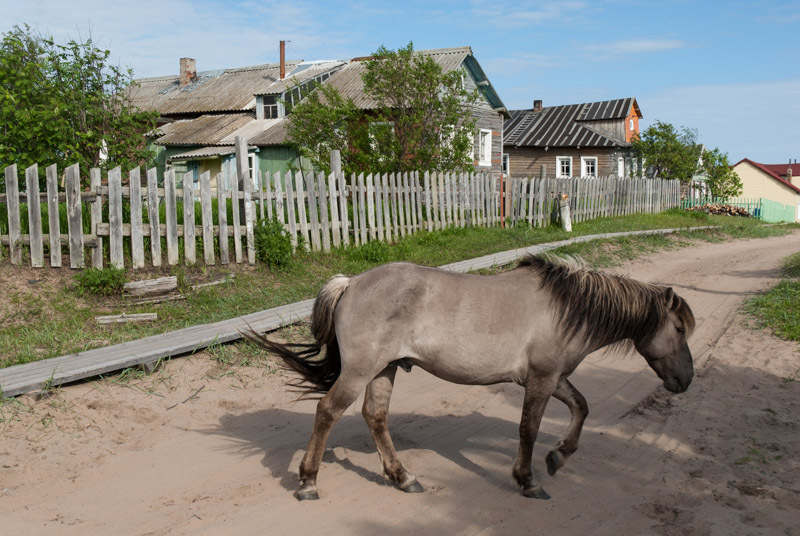 The village sits on an eight-kilometre bar of sand brought from the hinterland by the Varzuga River, which meets the White Sea here. The river is un-bridged and thus Kuzomen marks the end of the road; beyond is just roadless wilderness, curving around the coast of the peninsula all the way back to Teriberka. The scenery is magnificent and after driving a short distance in the sand I decide to camp for the night on the beach, just above the high water mark, watching an endlessly changing sky of subtly textured clouds as a sea squall makes its way ashore. Returning along the coast I stop at a point on the beach where the pink volcanic bedrock has a seam of rich purple amethyst, a hint of the mineral riches found in Kola’s volcanic rock. Later I stop at some rocky coastal hills near Kandalaksha, from where the view across Kandalaksha Bay is unexpectedly mesmerising; a wide tapering bay of blue water between the rugged coasts of the peninsula and mainland, dotted with pristine forested islands, one of the most beautiful spots I can remember seeing in Europe. I take a very steep, rough track down to the bay to reach an intriguing Neolithic labyrinth whose function remains only speculative, but of which examples may be found at numerous sites around the White Sea. It’s another magnificent spot and so I decide to stay for the night, looking out towards the low, rolling hills of the mainland which are illuminated by the low rays of the night sun, their tops treeless and white with tundra. As midnight approaches the shadows creep slowly up the hillsides across the tranquil mirror of the White Sea, which reflects lances of cloud in a yellowing sky; a perfect final wild campsite in Russia. It’s a seven-hundred kilometre drive south from Kandalaksha to Petrozavodsk, but I break the monotonous journey in the town of Belomorsk, another White Sea port from where one may reach the Solovetsky Islands. 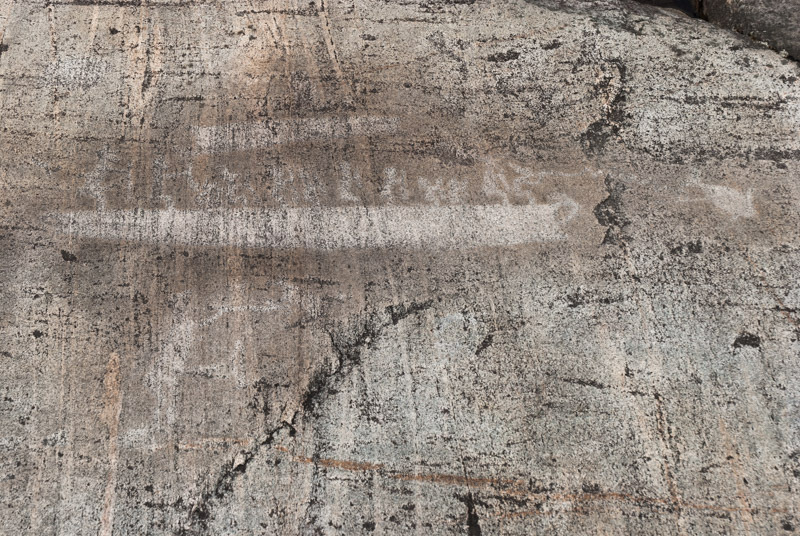 Nearby in a rocky forest clearing accessible only by foot is the Neolithic petroglyph site known as Zalavruga, where the pinkish gneisses are covered by expressive ancient rock art. The style is consistent with that found across Eurasia, but here there are also rich scenes of hunting moose and whales; perhaps my favourite is of twelve men paddling in a boat, poised with bent knees, pursuing a harpooned white whale; a fascinating insight into Neolithic culture. I reach Petrozavodsk, the Karelian capital in the evening where I am hosted by Anton, who lives with his girlfriend and two sons. Anton is an architect and a talented photographer and explains to me that he has ‘some problems with his passport’ and therefore only travels in Russia; something he has done quite thoroughly to destinations as far flung as Wrangel Island, where the very last mammoths would have roamed at roughly the same time that the petroglyphs at Zalavruga were being carved. Petrozavodsk sits on the shores of Lake Onega, the second largest in Europe and I make a tourist trip the next day on a green Soviet Kometa hydrofoil to the museum island of Kizhi. There were once several villages located on the small island, notable for their beautiful wooden churches. 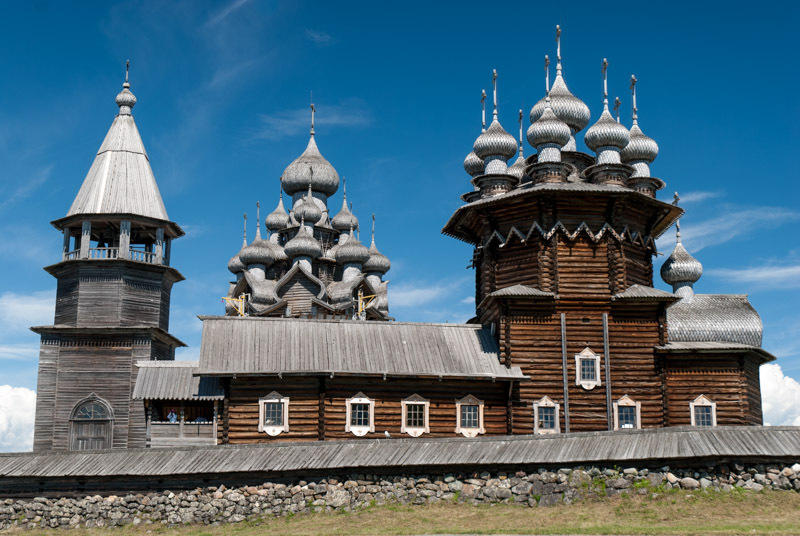 Today the entire island is a museum, centred around the two highly distinctive eighteenth century wooden churches (one with twenty-two domes and the other with nine) which together are known as Kizhi Pogost. Elsewhere around the island are a number of other churches transplanted from across Karelia, as well as several large Karelian wooden farmhouses showing how peasant families lived here; in surprisingly good conditions if the preserved and period-decorated rooms are to be believed. It’s hardly an adventurous destination but the walk is very pleasant and free from mosquitoes for once and with beautiful views of a gathering storm out across the beautiful blue waters of the lake. Back in the capital I spend another day strolling and find Petrozavodsk to be a very pleasant, if not particularly interesting city. 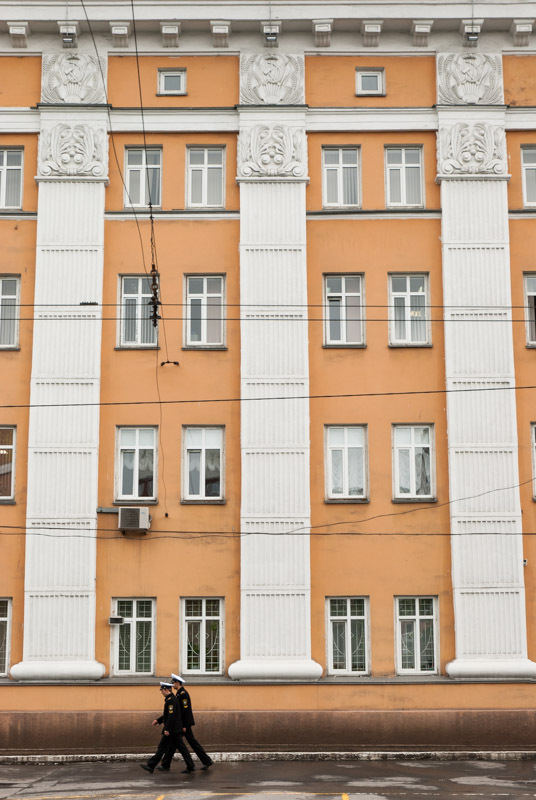 Like much of Karelia it feels slightly more westernised than much of Russia with some nice real-estate; tree-lined streets of good-looking apartment buildings, though very little pre-dates the Second World War. It feels like a particularly liveable city and I decide that it would most likely be my pick of Russia’s European cities in which to live. 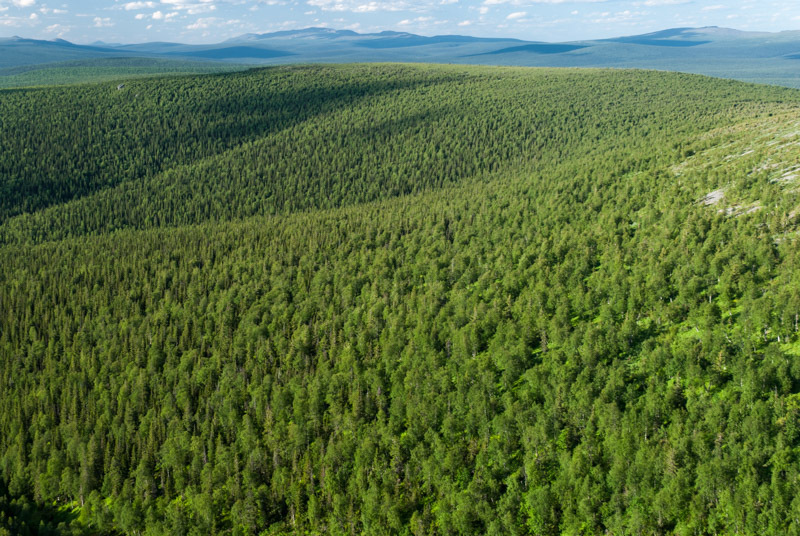 After two relaxing days in Petrozavodsk, I start the final trip south, leaving the forested northern wilderness and driving just south of Lake Ladoga towards Saint Petersburg. I make one last stop in the town of Staraya Ladoga a few kilometres off the main road. Occupying a grassy bank of the Volkhov River, Staraya Ladoga was one of Russia’s oldest cities, located on a trade route between Scandinavia and the Middle East and according to legend was founded by Rurik, the first Varangian (Viking) leader of ancient Rus’. 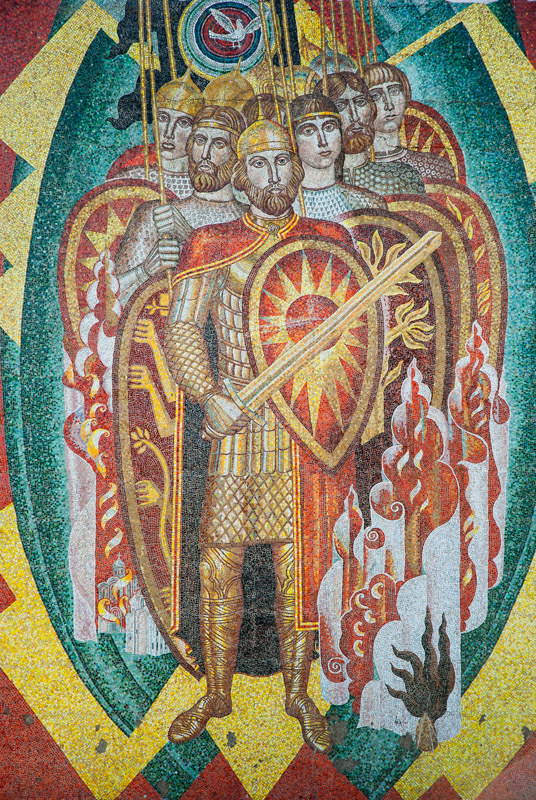 Today there is a rather obviously restored kreml (fortress), two old churches and even an ancient burial tumulus attributed to Oleg of Novgorod, a close relative of Rurik, but somehow the place has the air of histrionics about it and lacks in authenticity, with a colourful recent mosaic of the legendary Varangians leaving the most lasting impression upon me. I turn south well before Saint Petersburg but get caught up in the furious Friday afternoon traffic heading out of the city; a miserable spectacle of reckless speeding through small towns and villages which I find wearying. Just after midnight I pass through Pskov, thus for a second time passing one of European Russia’s nicest cities unfortunately without stopping. In the early hours of the morning I slip out of Russia, thus ending my 2015 journey. I greatly appreciate the luxury of being able to take eight weeks of holiday from my job, but at the same time I realise that the trip, with its defined time constraints, has been fundamentally different from my previous, long-term travels. Nevertheless, making this trip to the edges of European Russia has shown me yet more sides to this ever-fascinating country, but I am also conscious that winter, with frozen swamps and not a single mosquito, is the time to really explore the Russian North. And such are the beginnings in my mind of a very ambitious trip to cross Russia to the Pacific Ocean in Magadan and then return in winter; a trip for which I will need a different vehicle and a lot of research and preparation. I stop the next day with my old friend Maciej in Gdansk, then after a swelteringly hot rest day drinking beer and catching up in his apartment, make the final drive across Germany and back to base on the 7th July 2015, where I must slip back into my odd corporate double-life and begin planning and preparation for the next Russian adventure. I loved Varzuga i felt like being in the real Russia from a hundred years ago. Im curious where you research your trips. I personally read a lot online for my travels and still Im always learbinb new places I disnt see from your blog. Really great info as always thanks for sharing. Thanks for your comment, I just took a look through your Instagram account and was happy to see a few places from southern Pakistan; one of my favourite places on Earth! I very much enjoy places like Varzuga in Russia; villages which are still ‘alive’ but not big enough to be spoiled by ugly modernity. It helps that they have a big industry of fly-in, big-money salmon fishing tours on the Varzuga River.